Master Turgunbai Mirzaakhmedov's 2008 adras (silk/cotton mix). Once again art historian Binafsha Nodir and artist Bobur Ismailov have collaborated to produce an exceptional exhibition in Tashkent. Titled The Thread that Connects Generations, it is dedicated to the work of the Margilan masters - the Mirzaakhmedov dynasty. (Margilan is located in Uzbekistan's Ferghana valley). 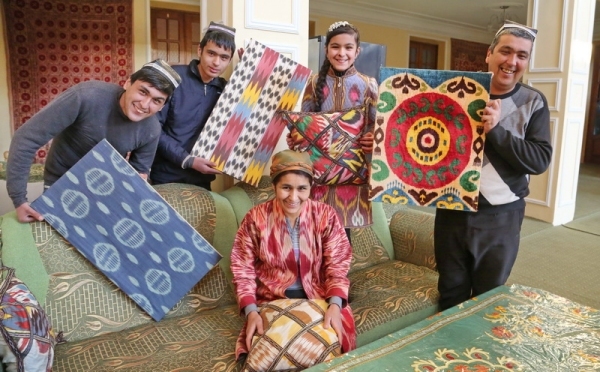 It is in large part thanks to this family that the art of ikat has been revived, e.g., Rasul Mirzaakhmedov worked with Oscar de la Renta to reintroduce baghmal, silk velvet ikat, the production of which had been lost. 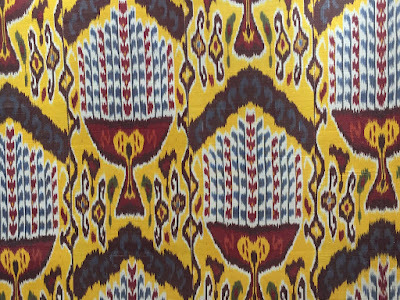 Ikat refers to both the type of fabric and the resist-dye technique used to create the cloth. To make ikat, parts of the warp (the yarns which run vertically) or the weft (horizontal) yarns are bound and placed in a series of dye baths. The parts of the yarns that are tied and protected resist the dye, allowing masters to produce multi-colored textiles through exposing the yarn to multiple dye baths. 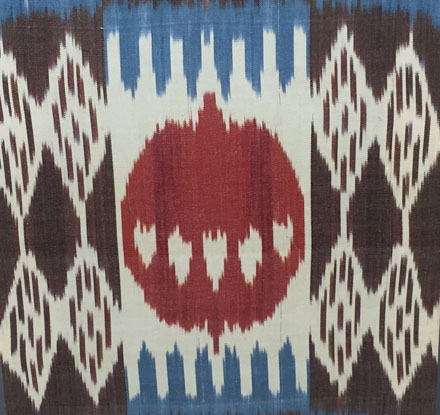 Unlike carpets or tapestries, the design of an ikat is articulated on the yarns before weaving begins. Tashkent's House of Photography proved an excellent venue. Special walls and lighting were installed to best display ikat fabric as art objects. 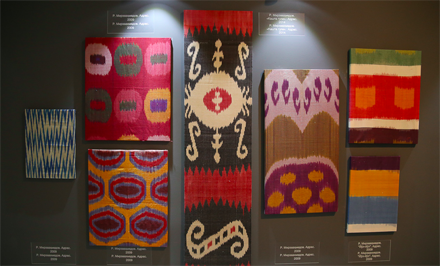 The exhibition's first room showcases recent ikat fabrics of the Mirzaakhmedov masters. There are three exhibition spaces. 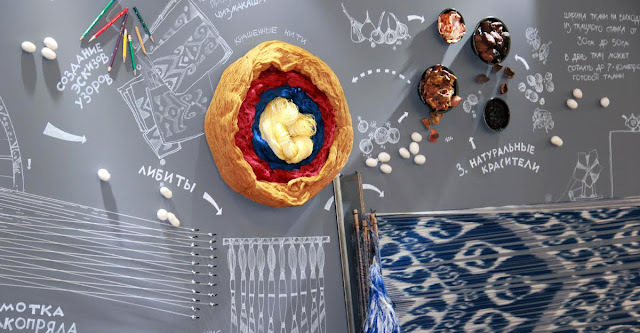 The first space showcases fabric woven by the Mirzaakhmedov masters: Rasul Mirzaakhmedov is the ninth generation and his two sons will follow in his footsteps. As well as fabric samples, this room includes original sketches and instructions of Rasul's father, Turgunbai. 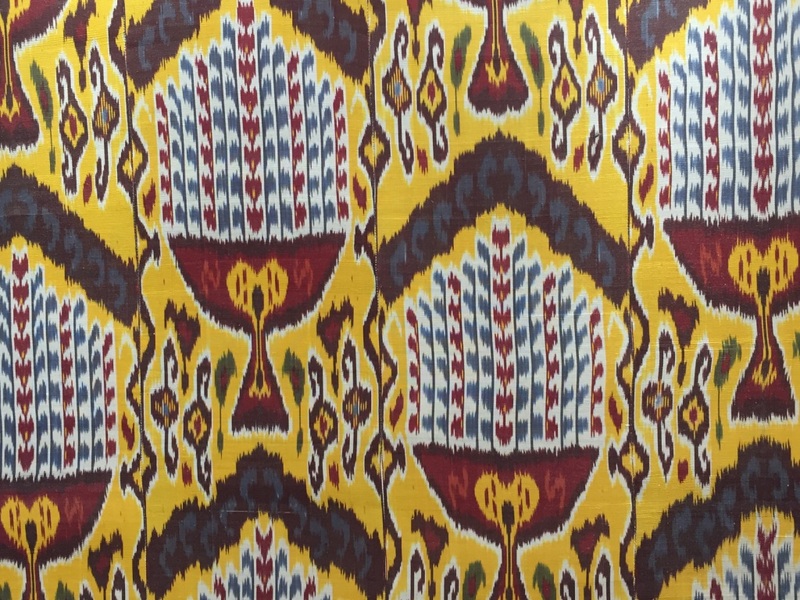 Turgunbai created over 200 ikat designs. Adjacent to this room is an installation of a loom (and cocoons!) so visitors may view how ikat fabric is woven. This room includes marvellous black and white images of Margilan weavers of the 19th and early 20th centuries. The installation in the third room provides a wall-length overview of each step of ikat fabric creation. On the opposite wall is another series of black and white photographs of people involved in ikat creation dating from the late 19th century until the present day. This outstanding exhibition places artisanal work, often deemed simply "craft" on the same level as fine art. If you are lucky enough to be in Tashkent before 12 July, then this exhibition is a "must-see". Otherwise, I highly recommend the catalogue designed by Tashkent artist Inna Sandler, titled "Нить, соединившая поколения". It is written in Russian and Uzbek - ISBN 978-9943-388-97-0. Try to get a copy just for the fabric images and design sketches. An English-French edition is planned. 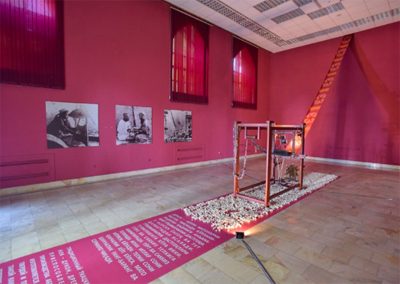 This exhibition is one of the first projects of the Islam Karimov foundation, a charitable organization named in honour of the late Islam Karimov, who served as independent Uzbekistan's first president from 1990 to 2016. The Karimov Foundation operates programs both in Uzbekistan and abroad with the goal of promoting Uzbekistan’s historical, cultural and literary heritage.